Patricia Camilleri, Malta Archaeological Review. 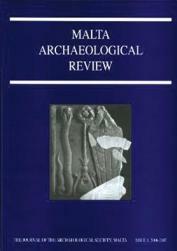 The Journal of the Archaeological Society, Malta, Issue 8, 2006-2007. pp 80. George Azzopardi discusses cremation burials in Early Bronze Age Malta, making use of evidence from Early Bronze Age sites in Tarxien and Ġgantija. His analysis starts by the scouring of the earliest available literary evidence from the Aegean region but then he also makes comparisons with other sites/materials outside our islands to reach interesting conclusions as to why Temple Age sites were utilised as burial sites as a sort of cultural identifi-cation, a continuity and con- currently a break with Malta’s earlier inhabitants. Azzopardi also advances a theory regarding the enigmatic clay discoid figurines so far exclusively found in Malta’s Early Bronze Age context. He draws interesting comparisons with ceramic figures from Romania and ritual practices in Minoan Crete. Speaking of enigmatic remains, the geomorphologist Derek Mottershead discusses whether the Maltese cartruts were cut by wheels or fashioned appositely by tools. Dr Mottershead carefully analyses field evidence from Dwejra in Gozo and Għar il-Kbir near Buskett and reaches the conclusion that “it would appear inherently unlikely that any significant fraction of the original was cut by hand”. Francesca Bonzano, a member of the Missione Archaeologica a Malta since 2001, writes about four small fragments of a white marble frieze found at Tas-Silġ sanctuary, and which fit with a marble slab in a private collection bought in an auction at Żejtun in 1985. Stylistic considerations place it around the first century AD. After having provided protection for some of Malta’s earliest inhabitants, Għar Dalam became a most welcome shelter for WWII refugees. John Borg relates this little-known episode in the history of one of Malta’s most important archaeological sites. In the late 17th century, orders were given to demolish Siġġiewi’s old parish church, which had experienced structural damage and had become redundant with the building of Lorenzo Gafà’s new parish church in 1682. A small baroque gem was thus abandoned to suffer the ravages of time and man. But in December 2007, the church was chosen for a conservation project that included an archaeological excavation and was to lead to the site’s rehabilitation and the recovery of a significant cultural inheritance. Paul Saliba, a research coordinator at the Ministry of Resources and Rural Affairs’ restoration unit, gives an excellent account of the entire process, complete with numerous plans and photos, which can serve as a model to recover similar deserving sites in Malta. Siġġiewi is also where a late Punic-Roman or Roman rock-cut tomb, which ended up as a water cistern, was recently discovered in the grounds of the Limestone Heritage complex. Mevrick Spiteri and Nicholas Vella report on this find. David Trump, the doyen of Maltese archaeology, shares some new thoughts on the lost Xewkija temple site Fr Manwel Magri had investigated in 1904 and other archaeological sites. The total absence of Tarxien phase sherds leads Dr Trump to posit that the Ġgantija community could have eventually established its authority over the entire island, leading to the abandonment of the Xewkija complex. But then he also points out the caveat that “negative evidence is never as reliable as positive”, with particular reference to sites as the enigmatic Debdieba, Ras ir-Raħeb, and the Trapna tombs. Roman architectural practice and the funding of public buildings are discussed by Lino Bianco, and German archaeologist Heiko Wagner, who spends most of his holidays in Malta, notices a limestone slab with a particular colourful geological feature at Mnajdra which might have had symbolic or ritualistic meaning. Readers wishing to become members of the society and to receive this publication should access the website www.archsoc.org.mt to receive all the relevant details.